Workers at the Center for Bioinformatics, University of Hamburg recently published an article describing a freely accessible web-based application (PoseView) which automatically generates two-dimensional diagrams of macromolecular complexes illustrating the key ligand-protein interactions. In the article the authors describe the application and it’s performance in extensive testing against complexes in the PDB. The application is very simple to use and our own rudimentary tests generated some very acceptable results which can be exported in pdf format for use in presentations and reports. A licensed, standalone (and more highly featured) version is also available. By way of example, a PoseView representation generated from PDB2RIP (A DPPIV-inhibitor complex reported by Pfizer), is shown below. A link to PoseView has been added to the sidebar under MedChem Resources. 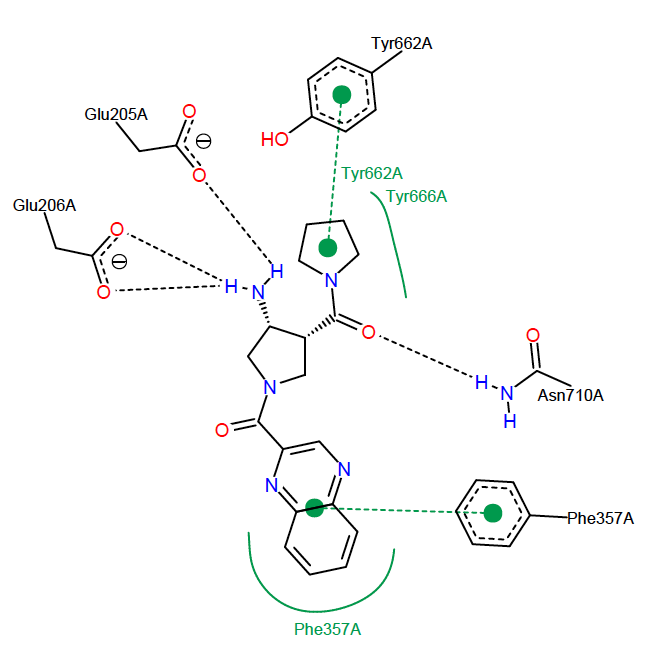 This entry was posted in Software and tagged DPPIV, ligand-protein complex, Pfizer, PoseView, software, Structure Based Design, University of Hamburg, X-ray data. Bookmark the permalink.